A Venice businessman is facing strong opposition to his plan to permanently convert a rent-regulated building into an extended-stay hotel in the seaside community. Los Angeles city planning commissioners ruled against Carl Lambert’s request to continue to operate the property at 1305 Ocean Front Walk as a hotel, according to the Los Angeles Times. Lambert said he’ll appeal the decision to the Los Angeles City Council. The ruling is part of a larger political and legal battle that Lambert’s been fighting with the city of L.A. since 2016. That’s when the city filed a civil suit against Lambert and a handful of other landlords, charging they were illegally operating rent-regulated apartment buildings as hotels. Last year, a Superior Court judge threw out some of the city’s claims, but a trial is set to begin at the end of May on remaining claims of false advertising and unfair competition. Lambert bought the 32-unit building in 2005. He then renovated it, renamed it the Venice Suites, and has since been advertising it an extended-stay hotel with furnished rooms with small kitchens. Studios rent for between $2,180 to $3,550 per month, according to the property’s website. 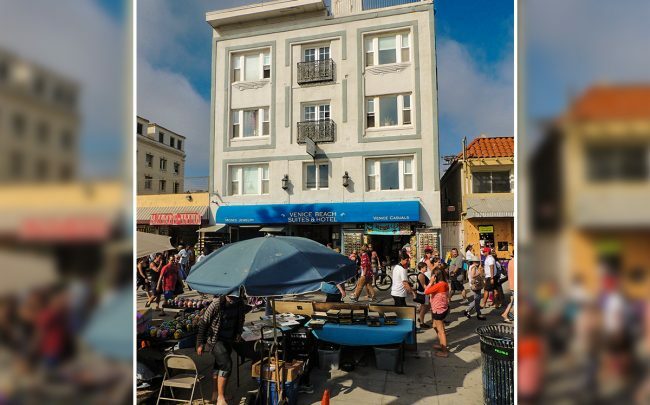 Rent-stabilized tenants paid around $500 per month for apartments in the 1990s, former tenants told the Times, but Venice is far different today than what it was two decades ago.